The process is fast and easy. Our average turnaround time is 5 minutes to 1 hours! 100% Guaranteed! Q: How much will is cost to Unlock my LG Optimus G2? A: The pricing will vary depending on the Network your LG Optimus G2 is locked to. Do a code look up below and you will see the pricing for your device. 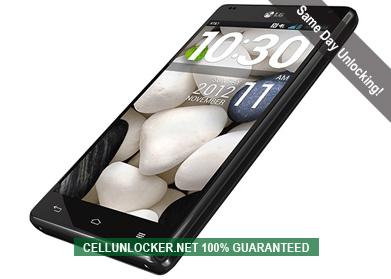 Q: How will I receive my Unlock Code for my LG Optimus G2 and how long will it take? A: Yes, all of our codes are 100% Guaranteed and genuine to unlock your phone’s Network. Please keep in mind, an unlocked phone will not be compatible with every Service Provider. It is up to you to verify with the carrier you wish to use if your LG Optimus G2 will be compatible on their network after being unlocked. Q: Will Unlocking my LG Optimus G2 damage my phone or erase any data? A: Absolutely not, the method we use is the official and genuine way to unlock your LG Optimus G2 via Remote unlock code. After Unlocking your device nothing will change, except your phone’s ability to use other network simcards with it. It is 100% guaranteed and safe for unlocking your phone’s network.